The battle for Earth begins at sea in the epic action-adventure, Battleship, starring Taylor Kitsch, Rihanna, Alexander Skarsgrd, Brooklyn Decker and Liam Neeson. An international naval coalition becomes the world's last hope for survival as they engage a hostile alien of unimaginable strength. 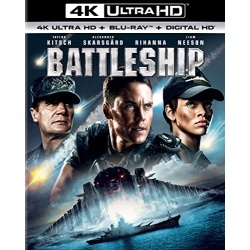 Ripping across sea, sky and land, Battleship is "a big, bold blast" (MSN Movies), packed with spectacular visual effects and explosive action.